It’s official. If you start hanging around with bad girl Rihanna, there’s a good chance you’re going to find yourself at a tattoo parlor before the night’s over. British supermodel Cara Delevingne recently got her first-ever tattoo, which features an intricately detailed lion’s head on the lower section of her index finger, and she has Rihanna to thank! Well, for the referral at least, and possibly for the location idea as well. RiRi recommended her favorite tattoo artist, Keith “Bang Bang” McCurdy, to ink Cara’s lion tattoo, and we all know that Rihanna is a huge fan of finger tattoos, although her “Love” and “Shh…” finger tats are a heck of a lot more discreet than Cara’s. 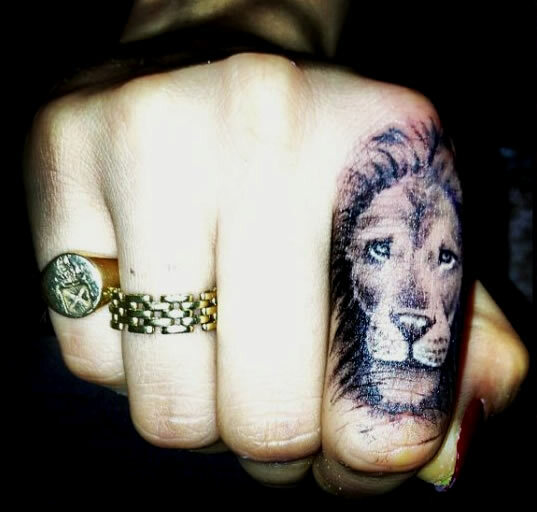 But we have to admit, the lion head inked on Cara Delevingne’s finger looks pretty damn cool! Cara Delevingne took to Twitter to debut her brand new lion tattoo on May 14, writing “My first tattoo!! Lions rule! Thank you so much @bangbangnyc @badgalriri.” Rihanna joined in on the fun and posted a pic of Cara’s new tattoo, along with the caption “My lover @caradelevingne just came over and got tagged for the first time!! Only by the best @bangbangnyc #Zodiackilla.” It’s obvious that Rihanna is a fan of Bang Bang’s tattoo skills, and we think Bang Bang is a pretty big fan of Rihanna too, considering his website features a huge picture of RiRi flaunting her new (at the time) Egyptian falcon ankle tattoo. Plus, Rihanna’s hashtag gives us a little hint as to the meaning behind Cara Delevingne’s finger tattoo of a lion, which represents the model’s astrological sign. Cara’s birthday is August 12, so the girl is a Leo! At the Met Gala last week, Cara Delevingne said she wouldn’t be attending the after party because she was getting a new tattoo the following morning. A few hours later, Cara was spotted at the after party with none other than Rita Ora, who got inked last week by…guess who? That’s right, Bang Bang. There was no sign of a new tattoo on Cara’s body but we’re guessing no one was looking at her finger! So Rita Ora, Cara Delevingne and Rihanna all have Bang Bang creations inked on them, as do other tatted-up pop stars like Chris Brown, Justin Bieber and Katy Perry. In a previous post, we discussed how similar Rita Ora’s tattoos are to Rihanna’s, and now it seems Cara Delevingne is drawing some tattoo inspiration from RiRi as well. What’s more, rumor has it Cara is planning to stay at RiRi’s L.A. Mansion for the next few months…we can’t wait to see how many new tats the duo has before the summer’s out!